We never compromise in our Wood quality, Sunrise Plex is always made with best quality Plywood. We understand our work, that's why we are known to be the best in the market. Al Nahr Al Seeni Building Material Trading LLC was established in 2009, with an aim to provide the most durable Marine plywood in the worldwide market..
Sunrise Plex Plywood are of the China’s renowned Manufacturers and Exporter dealing in the optimum grade of Plywood. We have a wide spectrum of Plywood, Marine Plywood, Film Face Plywood and Commerical Plywood, which is the prime choice in the market. We are a socially responsible company, offering eco friendly Plywood. 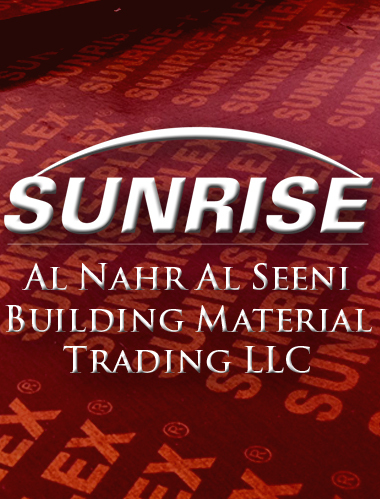 Sunrise Plex is serviced Al Nahr Al Seeni Building Material Trading LLC organisation and is responsible for marketing, sales and technical support for customers. For you to turn your design ideas into reality, we make a natural and innovative architectonical material that offers unlimited design freedom, Sunrise Plex plywood is build-up from wood veneers glued cross-wise, because of its build-up and way of production, Sunrise Plex plywood is a very strong material with a unique linear appearance that can be applied conceptually for the entire interior, our versatile products are durable and made to order, produced with regard for people and environment. Sunrise Plex the production organisation based in UAE and other GCC countries is responsible for the development, purchase and production of Film Face plywood and Commerical Plywood.